Easy to Use: - Ensure that shower surface is clean of any soap and dirt residues - Slowly run warm water while pressing down the edges of the mat to the ground - Use mat only for non-textured surfaces Ease to Clean: Machine washable. 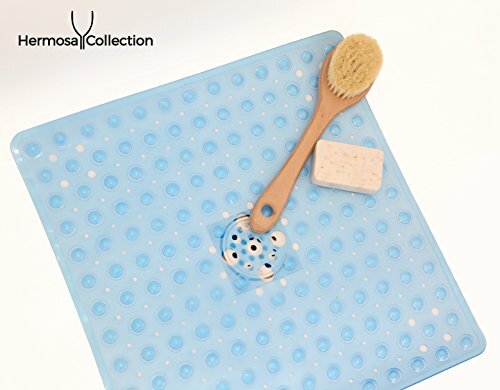 ULTRA STRONG SUCTION CUPS - Hermosa Collection suction cups guarantee that your bath and shower mat will always stay in place to reduce the risk of slip and fall. DESIGN AND SHAPE - 21" x 21" square shape in 2 different colors compliments nearly all existing bathroom styles. The intelligent holes throughout the mat allow for smart non-stop drainage. MULTI PURPOSE USE - Hermosa Collection Mats are suitable in Apartments, Condos, Single-Family Homes, Hotels, Gyms, Spas, Saunas and many other environments for extra protection. 12 MONTHS WARRANTY - Hermosa Collection accepts exchanges and returns for an extended period of time for your peace of mind. If you have any questions about this product by Hermosa Collection, contact us by completing and submitting the form below. If you are looking for a specif part number, please include it with your message.